Home » Breastfeeding » Underhanded marketing? Today I received an email from an Eumom partner asking if I’d like to complete a survey on “Being a mum” to be in with the chance to win flights. The survey I completed wasn’t about motherhood at all though, unless you consider the primary focus of your child’s babyhood to be how soon you start formula feeding them and which formula you will choose. I completed my postgrad in technical communication, and an important part of that course was the focus on information gathering. We learned that the way a question is asked may bias the answer. For example, if you ask a series of questions about someone’s awareness of a school shooting, and then follow up with a question about whether or not guns should be banned, you’re far more like to have people say yes they should than if you start with a series of questions about personal freedoms and gun ownership. The way you phrase a question may also imply that you are imparting truths rather than testing the participants knowledge. 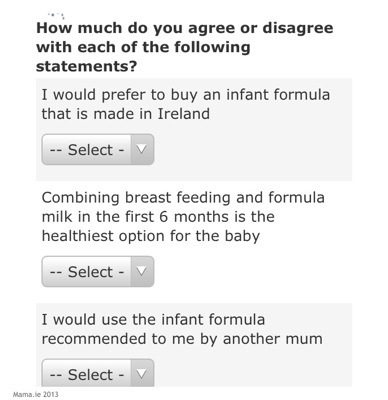 As I worked my way through this formula feeding survey, I kept thinking about that and wondering in whose interest this survey may be. I should have guessed that the questions weren’t going to be well formed when one of the opening questions establishing demographics asked me about my children’s ages and failed to give me an option for more than one child, unless I was currently pregnant. Next up, what feeding regime did I follow with my last baby prior to introducing solids? Exclusive formula milk, exclusive breast milk, initially breastfeeding followed by formula feeding, or breastfeeding with formula “top ups”. Ignoring the fact that there’s no option for initially formula feeding and then switching to breastfeeding (and why would there be – no one ever seems to tell women that that’s an option in the early weeks), the wording of the final option irked me. Why “top ups”? Why not combination feeding? I’m sure there are those reading this right now who are thinking “get a grip Lisa, you know what they mean?” but if you learn more about the insidious practices of formula companies as they attempt to grow their markets (start with The Politics of Breastfeeding by Gabrielle Palmer), you’d understand why I think language is important. Why else do we spend so much time listening to messages about “the benefits of breastfeeding” as opposed to “the risks of formula feeding”, and “breast is best” as opposed to “breastfeeding is normal”? Those marketing formula know well that language is important. Hence my problem with this wording. Top ups implies breastmilk isn’t enough and has to be topped up. Next question. “At what point did you introduce your baby to formula milk?” See what I mean about language? The next question is a doozy. It asks how knowledgeable I am about the relative benefits of breastfeeding and formula milk to my baby. Are there benefits of formula milk to my baby relative to the benefits of breastmilk? What are they hoping I’ll say here? I don’t really understand what they are asking. Then there are several questions about what sources of information I accessed to find out more about breastfeeding and formula feeding, from various medical professionals, to online support boards, to friends and family, and advertising. I assume this is so that the next set of advertising can be tailored to target mothers more closely. I hope I’m wrong. Then we’re on to brand recognition. 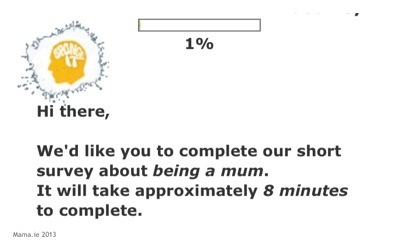 Is my ability to name brands of artificial baby milk integral to “being a mum”, which let’s not forget is the supposed subject matter for this survey? This is quickly followed by questions about my formula purchasing habits – which formulas have I used, which would I use, and which would I not consider. So far, so typical for a marketing survey. But t hen we got to the section that made my blood boil. Why would you consider switching to formula milk? Is this the bit that attempts to determine which popular breastfeeding or formula feeding myth you are most susceptible to? I think the reason this question annoyed me so much was because it reinforces the common misperceptions about breastmilk and formula milk. Remember this survey is aimed at pregnant women as well as women who already have children. By offering these as potential reasons for switching, the survey is (inadvertently?) validating those reasons. Starting with the hungry baby. Would you switch to formula milk if you had a hungry baby? Lots of people do. There’s a perception that formula milk is more filling and more calorific. This is only true if by more filling you mean more difficult to digest. Because from a calorie point of view, breastmilk averages more calories per ounce (source: kellymom). Who knew? Let’s just take those last two which perpetuate the myth that formula feeding somehow saves time. But last I checked making bottles, washing bottles, and feeding a baby those bottles takes plenty of time. It all goes back to a general misunderstanding about breastfeeding. For many people their only experience of breastfeeding occurs in the early newborn weeks, when feeding can indeed take a long time. But that’s because the effort required to breastfeed is front-loaded. You put time in in the first two months to save time later on. At five months old, as my daughter is now, feeds are generally short (she averages less than five minutes a feed), and I certainly have a lot more time to spare than I would if I was formula feeding. I know this for certain because I formula fed my son from seven months. I was that soldier boiling kettles, washing bottles, and mixing powder. So now I have a question. If you’re a newly pregnant woman taking that survey, what is your impression of breastfeeding after taking the time to consider all of those reasons for switching? It’s hard to know why you’d bother with it in the first place considering all those negatives. Almost 90% of the survey done now and it’s on to assessing your opinion on statements about feeding. One jumped out at me. “Combining breastfeeding and formula milk in the first six months is the healthiest option for the baby.” There’s no alternative statement to balance it out and say “Exclusive breastfeeding for the first six months is the healthiest option for the baby and is recommended by the WHO and the HSE.” Again, I’m thinking of my college days and all we learned about designing questions to elicit certain responses. And one final question to finish the whole thing off: “How acceptable do you feel it is in Ireland for mothers to breast feed their babies in public?” No comment. So where does that leave us? Well, the fact remains that I have no idea who the client is for this survey. It could well be a breastfeeding support body attempting to analyse the effectiveness of formula marketing strategies. But the likelihood is that it is marketing on behalf of a formula company. After all, it takes money to conduct marketing research, and because they don’t have a product to sell, most breastfeeding support agencies are sadly lacking in money. So I’m left wondering what insights are being gained by this survey on “Being a mum” and who is benefiting from it? Will the answers given here be used to drive breastfeeding rates down further and grow the market for formula milk? And why the need for such underhandedness with the misleading title for the survey? Oh my goodness. I’d be fuming if I got it. That’s the second “Irish Parenting” website to endorse a survey like this. I bet it’s the same firm that I had a run in with earlier this year…. So disappointing. You’re dead right to raise this. Maybe share this with a couple of newspapers to be honest. It’s just so misleading…and then worrying. Language IS important, Lisa and I think your points about the survey are very well made because it sounds more like an advertisement aimed at the person taking the survey than a survey that will inform the end party. Well written. Thanks Joanna. That’s how I felt taking it. Like I was being manipulated to think a certain way. Wow. That last question is really worrying. Incidentally, it was the “Closest to breastmilk” ad campaign that really solidified my decision to breastfeed. I remember seeing the ad in a magazine while I was pregnant (probably waiting at the doctor’s office) and thinking how ridiculous it was – that if the best marketing they could come up with was telling you how close it was to something else, why not just use that something else, which even they were admitting by that language was superior, in the first place? Especially since it was free and right there for the taking, all going well. Well I used Aptamil last time precisely because I had heard it was the most suitable for use with breastfeeding. I’ve since had a look at the ingredients and nutritional information in that and C&G and realised they are virtually identical. It’s all in the sell. This time around what got me was every time I turned on the radio, the SMA ad was repeating “Simply More Advanced”. No it isn’t! It’s Synthetic Milk Adaptation. I couldn’t listen to the radio when the feeding was hard going for fear of being bombarded with those ads. They chip away at you and eat at your resolve and determination. They just make it seem so easy. Which I suppose is their intention. Emily recently posted..Facebook Painting Giveaway! Very well said Lisa. I saw this survey mentioned online today by others but I hadn’t seen it as I’m not on the eumom website. Now I see why so many people were angry today. Particularly the undermining language used in the question about the reason for switching to formula. None of the options should actually prevent someone continuing to breastfeed if that’s what they’d like to do, but how many mothers will read that question and assume that returning to work or having other children to mind means that ending the breastfeeding relationship is inevitable. 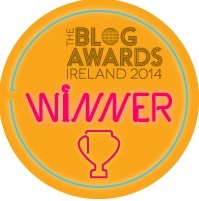 office mum recently posted..An anniversary and a giveaway! I know that last time I just assumed it made sense to wean before you returned to work. Thankfully this time I know better. Oh I hope not Julie. But that’s my fear. Hi Lisa. I enjoyed reading your post. You have hit the nail on the head – who is the client, why are the seeking this information, and to what purpose will the results of the survey be put to use? It also makes me wonder if indeed it is a formula manufacturer, to what extent are they funding the eum*m.ie site in general? I know I would have been swayed by this information as an expectant first-time mother but luckily experience has helped my critical factualties!